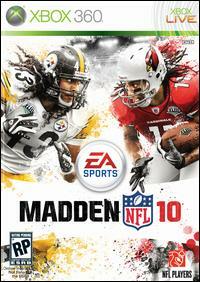 A video game staple for two decades, EA's best-selling football series rumbles onward with Madden NFL 10. Headlining the new features in this installment is the ability to take your franchise online. Madden NFL 10's franchise system supports up to 32 teams and allows owners to manage their organization away from the console via Internet browser or iPhone application. Online franchise play includes authentic NFL schedules, transactions, live drafts, adjustable depth charts, and stat tracking. Another key addition is the option to play a game cooperatively with a friend against the computer. Instead of sharing the same viewpoint, however, you will play from a position-specific perspective. Other changes involve tweaks to the play mechanics. Quarterbacks now automatically drop back behind the line of scrimmage to follow a three-, five-, or seven-step motion. The physics have been reworked to improve on the areas of tackling and blocking, while hot and cold streaks will dynamically influence a player's on-field ratings. Enhancing the television-style presentation is the all-new "The Extra Point" highlight show after each week in franchise play. Hosts Fran Charles and Alex Flannagan will give you a rundown of the week's top performances and highlights. Customize the game using an assortment of sliders, master the new wildcat formation on offense, and listen to broadcasters Chris Collinsworth and Tom Hammond call the action from the booth.